The Road to the Horizon: Rumble: Seychelles, hey? 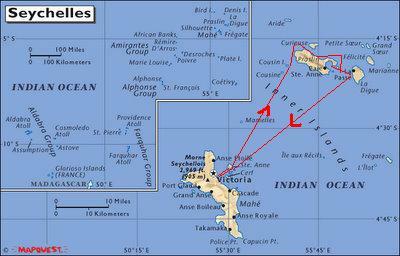 I guess before we post more about the Seychelles, we should start from the beginning: Where the ^$$££! are the Seychelles? 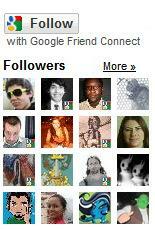 Look at the red dot on the map below. That's where. In Indian Ocean, just South of the equator. About 1,000 miles East from Africa. It is far away from anything. 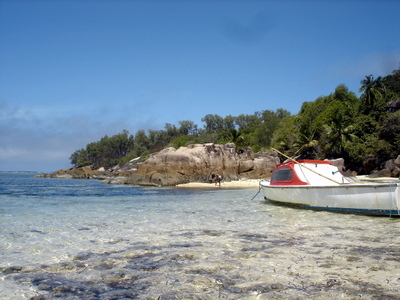 Although the Seychelles cover an immense area, most of it is water. 1.4 million km2 of water, with only 455 km2 of land condensed into about 115 coral and granite islands, many of them not much bigger than your backgarden (figure of speech). 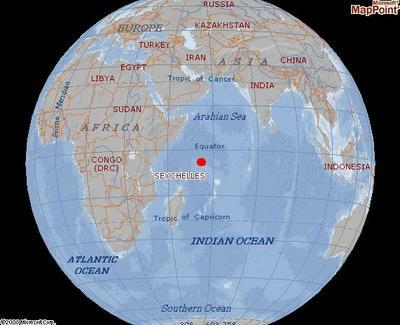 While from the North-East to the South West, the Seychelles spans about 1,000 miles (top left corner of the below map), during our holidays we only visited a small area (follow the red line on the lower right corner on the map). 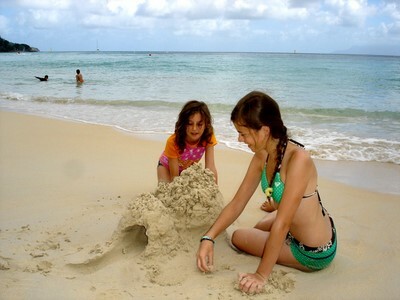 We stayed for one week in Beauvallon on the main island of Mahe, then sailed to the islands of Praslin, Cousin, Curieuse and La Digue for two weeks, followed by another week on Mahe. 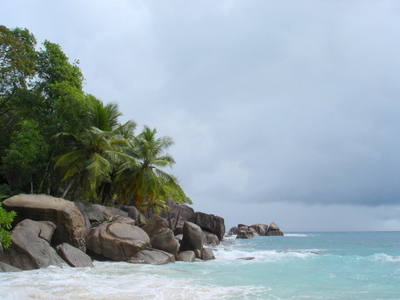 While Austronesian seafarers or Arab traders may have been the first to visit the uninhabited Seychelles, the first recorded sighting of them took place in 1502, by the Portuguese Admiral Vasco da Gama, who passed through the Amirantes and named them after himself (islands of the Admiral). The first recorded landing and first written account was by the crew of the English East Indiaman Ascension in 1609. As a transit point for trading between Africa and Asia, they were occasionally used by pirates until the French began to take control of the islands starting in 1756 when a Stone of Possession was laid by Captain Nicholas Morphey. The islands were named after Jean Moreau de Séchelles, Louis XV’s Minister of Finance. The British contested control over the islands with the French between 1794 and 1812. Jean Baptiste Quéau de Quincy, French administrator of Seychelles during the years of war with the United Kingdom, declined to resist when armed enemy warships arrived. Instead, he successfully negotiated the status of capitulation to Britain, which gave the settlers a privileged position of neutrality. It is said that as soon as the Brits left the island, de Quincy used to raise the French flag, until a new British vessel arrived back in port. In a way, this to-and-fro between French and English flags kinda explains why the islands are still melting both cultures and languages, with a fair mix of African and Asian ingredients. Britain eventually assumed full control upon the surrender of Mauritius in 1812 and this was formalised in 1814 at the Treaty of Paris. 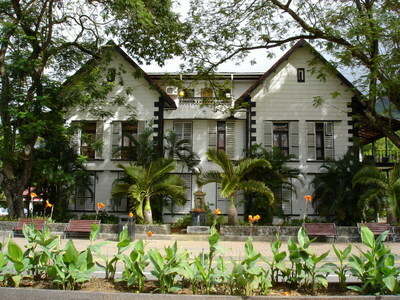 The Seychelles became a crown colony separate from Mauritius in 1903 and independence was granted in 1976, as a republic within the Commonwealth. In 1977, a coup d'état ousted the first president of the republic, James Mancham, replacing him with France Albert René. The 1979 constitution declared a socialist one-party state, which lasted until 1991. The first draft of a new constitution failed to receive the requisite 60 percent of voters in 1992, but in 1993 an amended version was approved and President René announced a return to the multiparty system of government. Today, the Seychelles is a stable country with 81,000 souls, mostly of a mix European, African and Asian origin. Their mothertongue is Creole, but both English and French are also official languages, spoken by all. The currency is the Seychelles Rupee, which trades about 11 Rupees to the Euro. In most restaurants and hotels, foreigners need to pay in USD or Euros. You can change currency in the banks, but you get 50% better rates on the streets. And there is no lack of people asking to change money. When we were there, the best rates we got for Euros was 18 Rupees. The best Dollar rate was 12 Rupees. 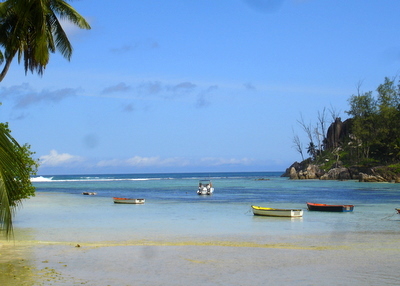 Little is produced in the Seychelles whose economy is mainly based on fishing and tourism, so most things are imported. And expensive. Very expensive. Very very very expensive! In the shops, four small limes went for about US$10. A 1/4th liter bottle of Evian went for US$3. A bottle of (the cheapest) South African wine: US$25. Partially because of the high prices, even for basic produce, but more as a concious strategy, the Seychelles chose for elite-tourism rather than mass-tourism à la Gran Canaria, Benidorm or Croatia. We had difficulties finding rooms less than US$700 a night. Prices in some of the more exclusive resorts (of which there were plenty), often went over US$1,500 per night. More selective tourism makes it easier for the government to keep control over the negative impact of 'the invasion of the masses'... This we could see easily: the islands were clean. The smaller the islands, the cleaner they were. The roads - even the remote ones, were well maintained. The waters and beaches - even on the main tourist beaches - were clean and clear. People were friendly and welcoming. 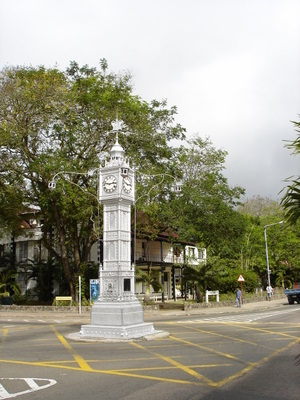 More posts on the Road about the Seychelles.